It has come to my attention that I have made the finalist list of the Boots Maternity & Infant Awards in the 'Best Parenting Blog' category! It's beyond exciting to see my name up there beside some amazing fellow-bloggers. I'm actually doubly-excited because I'm hoping to have my first ever article printed in Maternity & Infant magazine this month too. Fingers crossed! The only thing I'm not so thrilled about is that the awards winners are determined by a public vote... which means I now have to beseech you to click HERE - scroll down to the 'For the Family' category and find me under 'Best Parenting Blog'. I'd be ever so grateful if you could spare the time and effort! P.S. You might have noticed that I've changed my domain name a little bit! 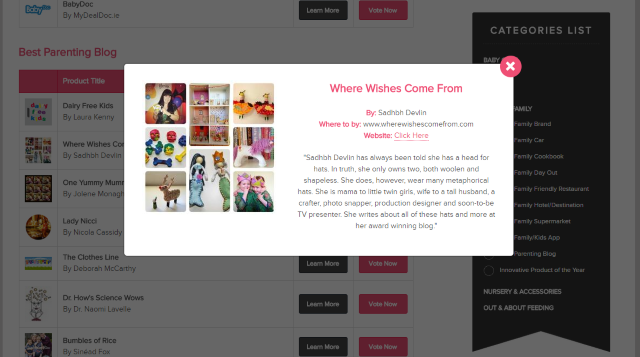 I've finally dropped the '.blogspot' bit and you'll find me under www.wherewishescomefrom.com from now on. I like that it rhymes!